For the first time, there's a true Practice Management system for Physical Therapy. 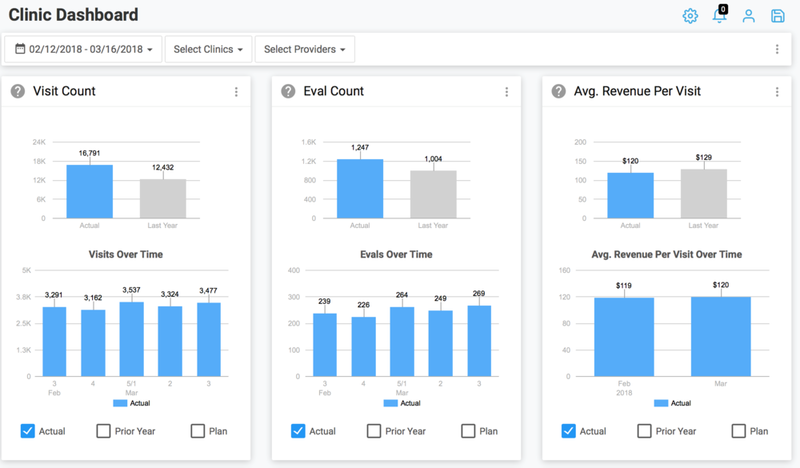 Practice Dashboard connects to your EMR and gives you all of your practice performance metrics in a simple and easy to use online tool. Practice Dashboard makes accessing your data quick and easy. We combine all the key data from your EMR and other relevant business systems into a single Dashboard that's intuitive and simple to use. We know how difficult it can be to routinely extract and compile all of the information you need to make informed decisions about your business. Practice Dashboard is pre-populated with nearly all of the important Physical Therapy metrics you watch (or should be watching) every day. We know you don't have the time to be running reports, you want to run your practice, so we've elimintated reports and instead give you the data and insights you need instantly, from anywhere. Built by Physical Therapy Operators, for Physical Therapy Operators. your data. your decisions. your success. As a fully-integrated hub for the key personnel in your therapy practice, Practice Dashboard allows real-time access to all facets of your business. Users can monitor key metrics such as daily visit activity, practice profitability, work-force efficiency, and customer satisfaction all through a single, unifying platform on either a desktop or mobile device. Compare data from multiple systems. Increase your profitability by gaining immediate access to the operational metrics and KPIs needed to inform the decisions you make on a day to day basis. We've built a suite of tools that every Physical Therapy owner, manager, therapist, administrator and operator should have by their side. Clinical stats, management tools, actionable data, wherever and whenever you need it. Practice Dashboard utilizes interactive data widgets spread across various workflow based modules to organize and display data vital to your operation, updating it in real-time and supporting user manipulation that promotes short-term, current state, and long-term planning. .
By harnessing data from your EMR system and stripping away complex clinical information, our Provider Dashboard module highlights transactional and performance metrics across your various practices and clinicians, empowering decision-makers with the necessary data to make informed choices regarding staffing, productivity, and overall financial health. Incorporating decision support functionality powered by sophisticated back-end logic, Practice Dashboard provides you with tracking and management tools that allow you to analyze referral trends, pinpoint and subsequently record the most optimal marketing visits, and incentivize business-to-business growth. so you want INTEGRATIONS, huh? DON'T SEE IT HERE? JUST ASK US. Practice Dashboard is a company that caters specifically to Physical and Occupational Therapy and the Therapists, Owners, Administrators and support staff. Practice Dashboard was created by Benjamin Sharpe over an eight year period as the CEO of a 25 location physical, occupational and hand therapy practice in Seattle, WA. Ben created Practice Dashboard out of a real business need he identified in his practice. Ben recognized that often times he needed to run multiple reports out of the EMR and then compile in another system to even try to interpret it. Hours upon hours were spent running reports to download the key data necessary to successfully operate the business. At one point, he even had several employees who were spending a ton of time running reports and sending them out to managers in the business. Sound familiar? Ben then did what most operators only dream of, he built a custom dashboard of his own to solve these problems. One that would automatically scrub and then cherry-pick the key metrics/data from all of the multiple software systems he was using and then condense it into one single place. He and his team had a single log-in with role-specific dashboards so that everyone had what they needed to see quickly and easily. He learned that he could use this new tool to streamline his business and make better use of his time thereby increasing his bottom line. In addition, because the data was so easily accessible, he was able to identify inefficiencies and take advantage of new opportunities that he never knew existed. That was over 8 years ago and during that time, the product has evolved into what it is today. With added features and functionality that every operator should have in their toolbox. Practice Dashboard was born from that DNA and it's only going to get better. Built by Operators. For Operators. Thank you for contacting PracticeDashboard.com! Our business only exists because of people like you. Please rest assured, this email has triggered alarm bells and super-annoying sirens! Our phones are literally blowing up as we fight over who gets to return your message. Thank you in advance for your patience. We can’t wait to speak with you! Thank you for contacting PracticeDashboard.com! Our business only exists because of people like you. We promise to keep you informed about what is relevant in Physical Therapy and your business. Thank you for allowing us the opportunity to partner with you!